Woman selling ota at Fiji's Savusavu market. It's the tall, leaf-wrapped bunches. Ota... a beautiful, ferny Fijian green. In Suva's bustling central market, it was an everyday item, but in Savusavu, ota's available only on Saturday, the day locals in come to the produce market in droves. I kept asking what ota was; unlike other produce, I never saw it labeled with a name. Besides, eons ago, I enjoyed fiddleheads from a Vancouver or Portland farmer's market, and vaguely recall cooking into an interesting stir fry. Wayne knows culinary challenges intrigue me and as does imbibing in navite culture and cuisine. Local foods are generally cheaper and part of what enables our travel is cutting corners. Trying out foreign foods in part drew me to this kind of travel in the first place and we haven't seen ota on the menu the few times we've eaten out. It helps that Wayne is wonderfully open-minded about my cooking experiments. Usually he's rewarded for that open-mindedness. In the case of ota, he was not. This is the ota with shorter fronds, recommended over the fluffier ones by the woman I bought from in the Savssavu Fiji market. Initially, we liked ota's taste - akin to asparagus, but earthier. But then, despite research and following a recipe (click here and here for ota recipes) the sensation left a decidedly unpleasant borderline disgustingly slimy furry feeling upon our tongues. Imagine a mix of the grittiness of a particularly sediment-filled red wine the morning after, mixed with grease, a bit of dirt and toss in some stray cat hair. Ugh. Darn! Apologies - I neglected to take photos of my ota soup's slimy countenance before we shamefully pitched it over the side under the cover of darkness. By no means is my intention to diss Fijian food. 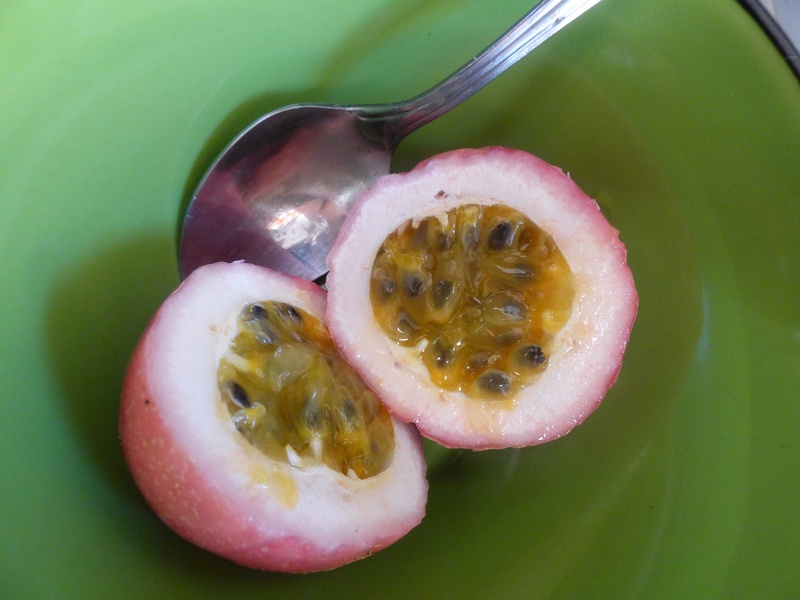 Passion fruit - one of many tropical favorites available in Fiji. I created a fabulous gluten-free muffin with ripened,boiled plantains (watch for that in a future post, with recipe and story). My improvisational tropical lamb stew is a new favorite. I enjoy papayas, mangoes, bananas, love passion fruit, and Fijian curries, even when I get the native bone-pickin' variety. My eggplant repetiore is growing by leaps and bounds. Eventually, I'll resort to a few okra dishes. Last night's supper was watercress soup, it's potentially unsafe to eat raw here. I even enjoyed "green caviar" (seaweed - again - watch for it in a future post). I do confess, I can tolerate but am not fond of the ever-present boiled cassava, and while I love the ceremony, will never crave kava (click here to learn more about kava and our Fijian experiences with it). I do reserve the right to change my mind. After all, my first attempt at cooking conch was disastrous (click here for that). Then I discovered conch salad and a delightful everything-you-ever-wanted-to-know-about conch book (click here for that) with a great chowder recipe. So, maybe the right recipe and some changes in technique will make all the difference. Perhaps for Fijians, eating ota is akin to gefilte fish for me. My darling Wayne responds to its mere gray, sodden fishy presence pure unadulterated revulsion. Yet for me, I love it. Is my affection for gefilte fish really due to my fond associated childhood memories of Passover seders and all its other food trappings, charoset, chocolate macaroons, matzah (and Dad's awesome matzah brei - sweet or savory), kid's-Kool-Aid-a-kick Maneschevitz "Mad Dog" wine? So if anyone in our travels can convince me ota is awesome, consider the gauntlet thrown! We are currently in Fiji cruiser mecca Savusavu, Vanua Levu, Fiji (S16.46.706 E179.19.785). We've hung out here for 2 1/2 weeks, the last of which in waiting for my Mac to get fixed. We hope to re-acquire my Mac today, fixed or not so we can move on. This post was composed on Wayne's PC laptop. This - my Mac with the back off - is a very, very bad sign when it comes to blogging and cruising plans!